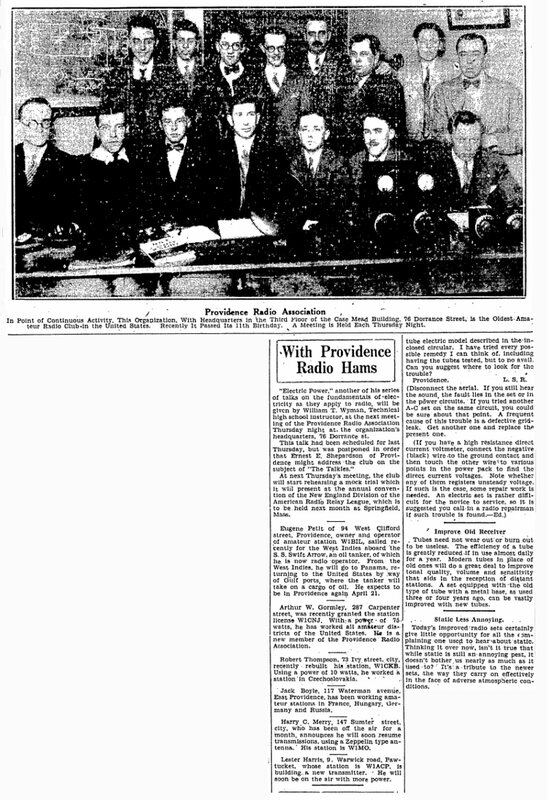 The Providence Radio Association (PRA) started in 1919 in the Elmwood section of Providence, RI. 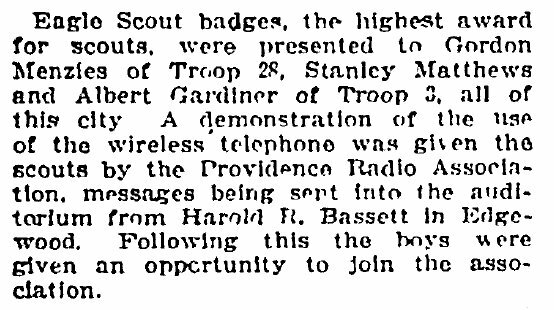 As far as can be determined at this time the members were young men with a common interest in the wonders of wireless. 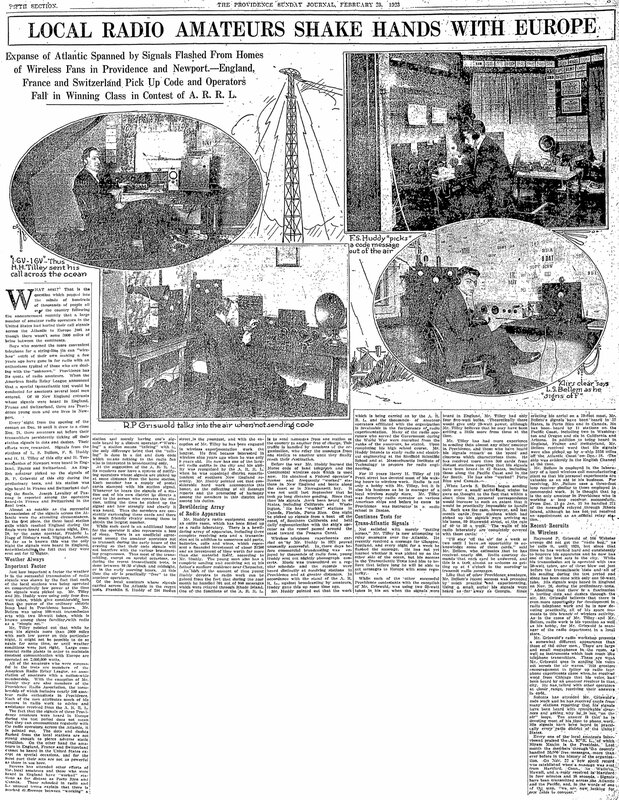 Amateurs had been off the air since the beginning of World War I and in that period all amateur licenses had expired and that it was not until November 1919 that hams got back on the air 14 . 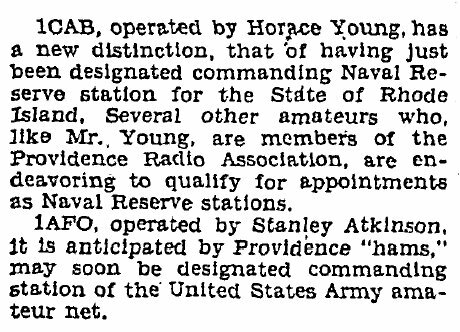 The club was formed by amateurs who were itching to get back on the air and those who had to wait for the war to end to allow them their chance at transmitting. 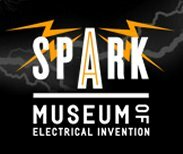 When many amateurs had left for war spark was still king, during the war many were exposed to CW (spark was legal on US ham bands until 1927). 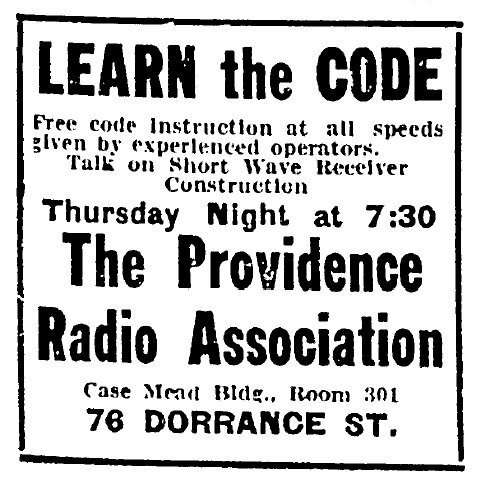 Even though the PRA was not the first ham radio club in RI, it was an early club (the earliest RI club that we find a reference to is the “Rhode Island Wireless Association” in 1910 15 ) and is the earliest surviving RI ham club. 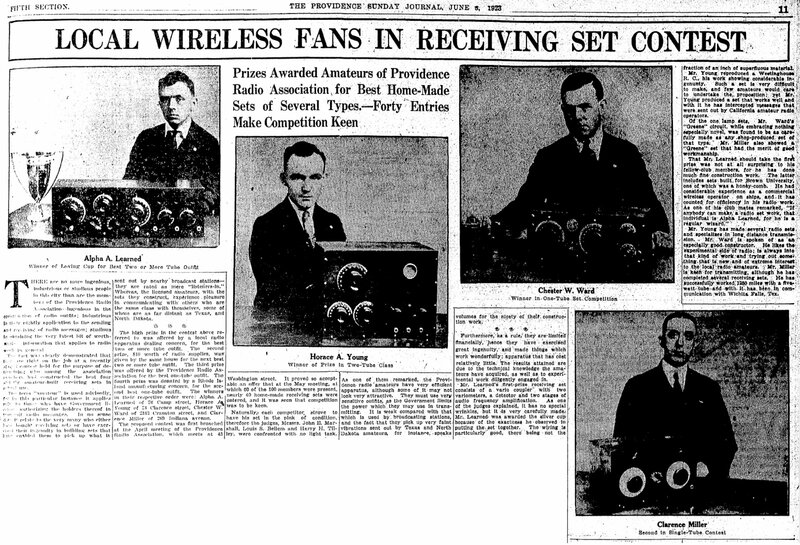 By September 1920 the group became more organized and were referred to as the Elmwood Radio Association. 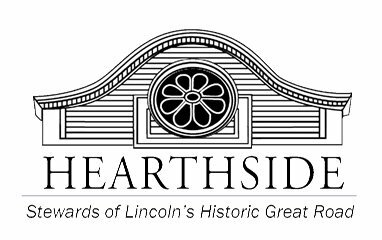 The eight original members were Lewis S. Bellem, Stanley S. Read, Howard O. Cushing, Harold O. Brewster, Earl Baldwin, L. Clifford Leighton, Joseph W. Cohen and Allen Cordin. 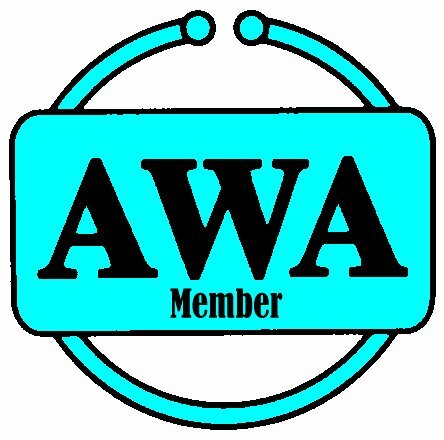 16 As the Elmwood Radio Association they met at Lew Bellem’s home at 99 Stanwood Street weekly to discuss radio and help each other. 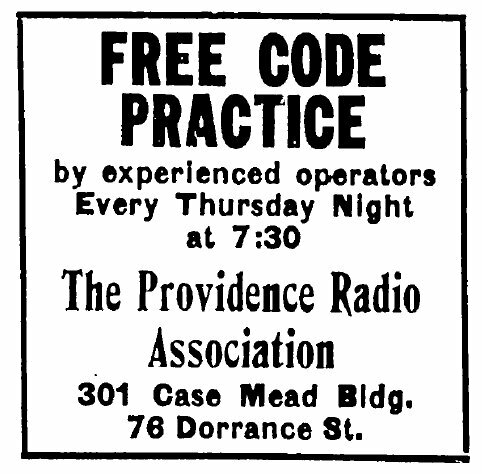 By 1921 they needed larger quarters and moved to the Providence YMCA on Broad Street and decided to change the name to the Providence Radio Association to reflect that they wanted to be more than a neighborhood organization. 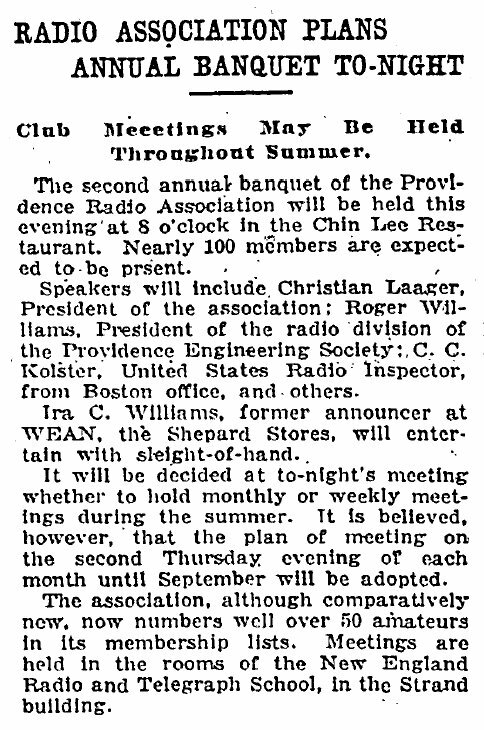 After a year the club filed a “Resolution of Affiliation” with the American Radio Relay League (ARRL) in October 1921 17 , with Lew Bellem, 1BES as president and Lew Leighton, 1ETD as secretary signing for the club. At that time the club was meeting in rm. 201 of the YMCA on Broad Street in Providence (a location the club would use on and off through the mid 1940’s). 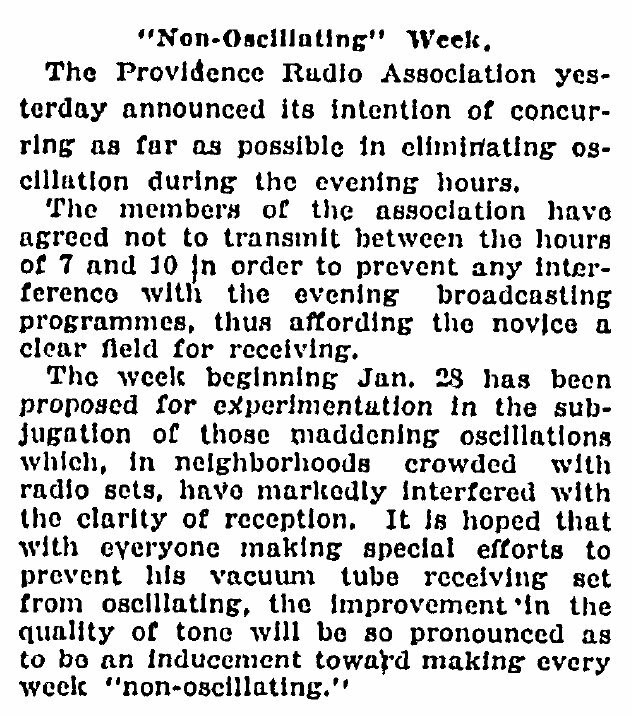 This resolution was approved by the ARRL on November 19, 1921 and an ARRL club charter of affiliation was issued. 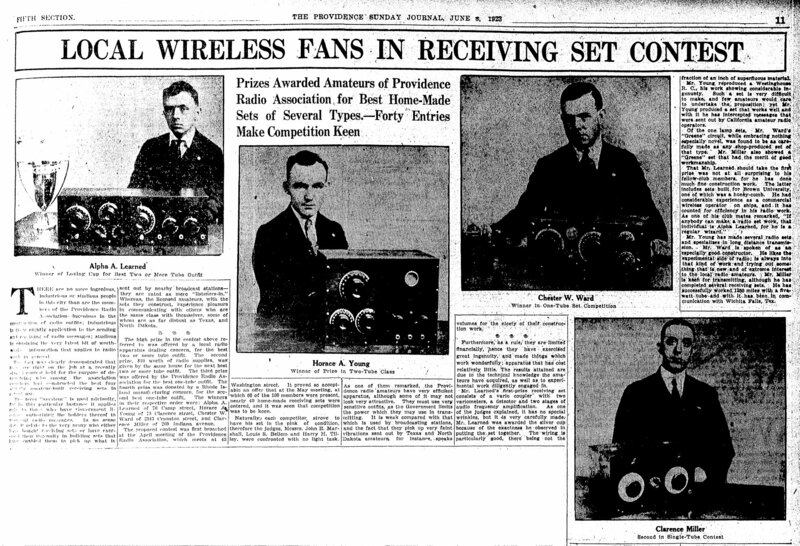 The members were a small group that continued to grow as the wireless boom of the 20’s occurred. By 1922 the clubs expansion caused a move to a rented facility at 159 Niagara Street. 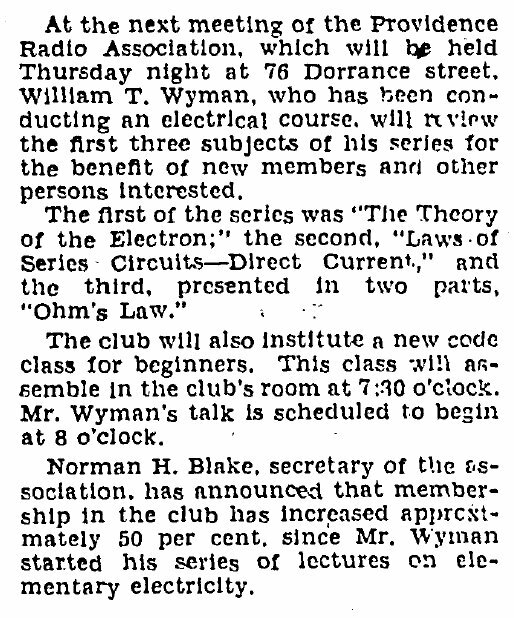 16 From 70 members in 1922 18 the club had grown by 1923 to 101 members 19 (of whom 31 were licensed). 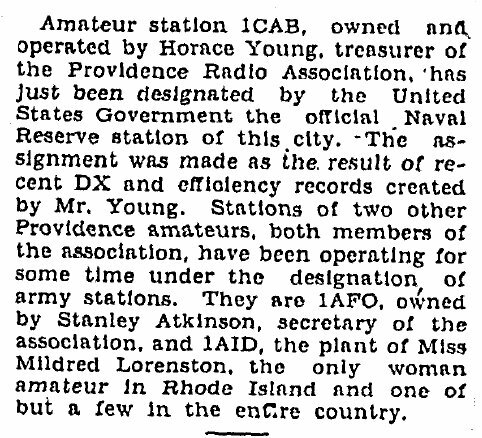 The fact that three years later in 1926 there were only 43 ham stations 20 (not counting 1LI) licensed in Providence shows that the club was the major organization for hams in the city of Providence. In fact the period for licenses was 2 years in this era and in 1926 there were only 14,902 amateur licenses 21 in the US and its possessions. The club realized from the beginning that the regulatory issues of our hobby were important. As one of the few hobbies that had codified federal regulations along with various local regulations and codes affecting it, this was a critical area that could not be ignored. They also recognized from the beginning that this meant representing the interests of all amateurs not only its members. 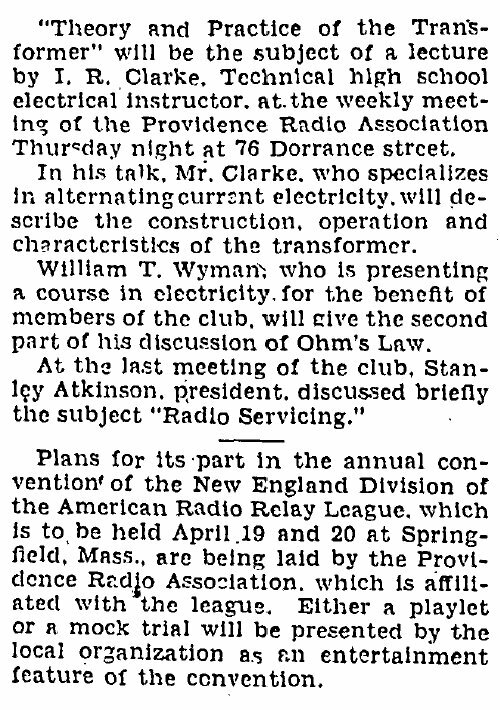 This is shown in an early article in the Providence Journal 15 about the clubs reaction to new radio regulations. The club has continued this representation of its members and the hobby in general in rule making issues to this day. 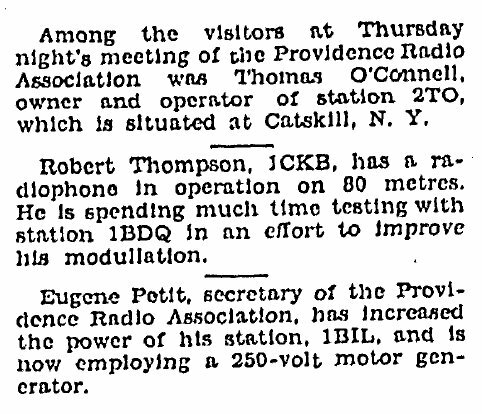 The club members were active in the experimentation that marked the continuing development of radio at that time. 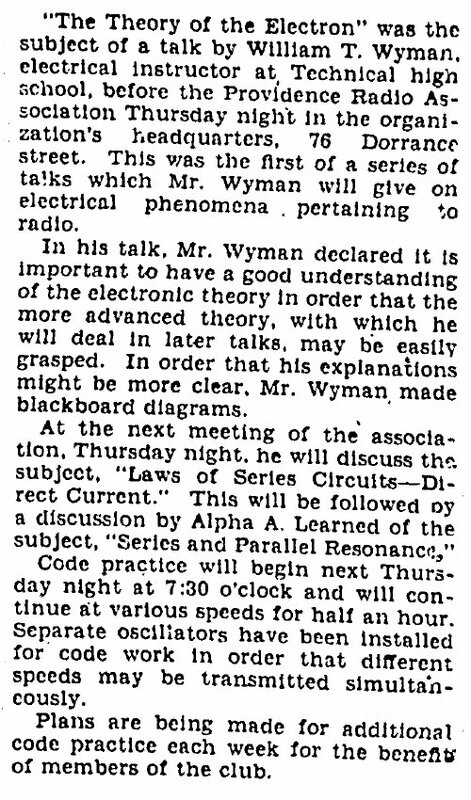 In fact Alpha Learned, 1AAU one of the PRA’s early presidents (and a ham and commercial operator prior to World War I) published three technical items in QST in the 20’s 22 23 24. 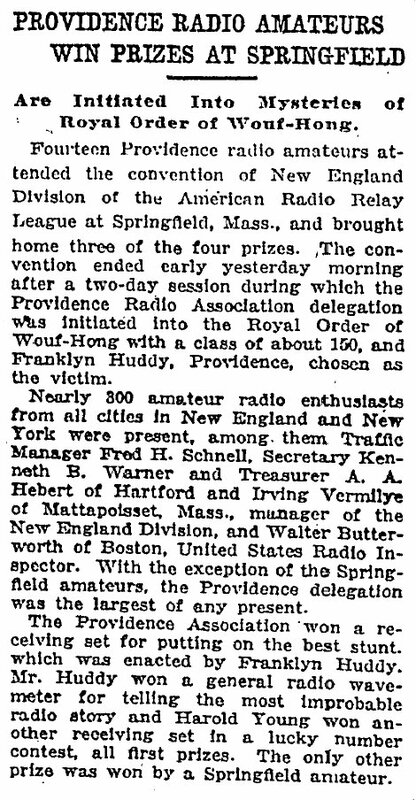 As most hams of the day did, the clubs membership was active in building their own equipment as is shown by a 1923 article in the Providence Journal that reported that the PRA had sponsored a receiving set contest 25 for its 100 members. 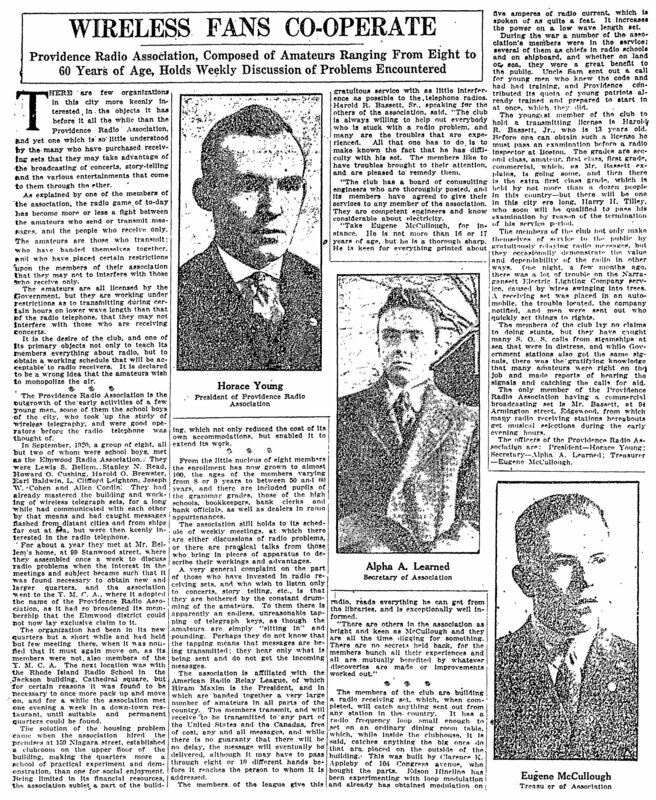 This contest was judged by John E. Marshall, Lou Bellem (1BES), and Harry H. Tilley (1GV). The winners were for two or more tubes Alpha Learned (1AAU), in the two-tube class Horrace Young (1CAB), in the one tube class Chester Ward (1ARK) and second in the one tube class was Clarence Miller. The article shows a picture of the proud winners with their professional looking gear and comments on Alpha Learned’s professional looking work which was consistent with his holding a commercial ticket and experience as a shipboard operator knowing the importance of good construction. This tradition of home brewing continues to this day as shown in the amplifiers in use at the W1OP shack in 2004 as well as the continued home brewing activity of various members. The PRA became one of the few club licensees in the early part of the century when in 1925 the club obtained 1LI1 26. 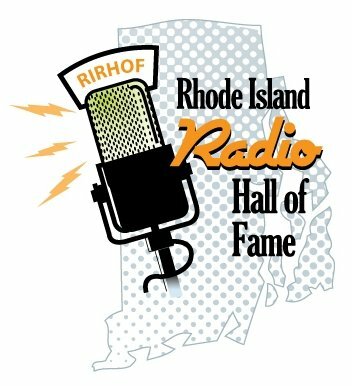 This made it one of only three club stations in Rhode Island that year (the other two being at Pawtucket High School and at St. George’s School in Newport). 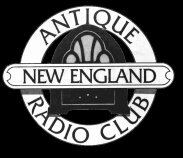 In fact in 1925 only 8 non-school radio clubs existed in New England and in 2004 the PRA and the American Radio Relay League (ARRL) station are the only two of that group still active. 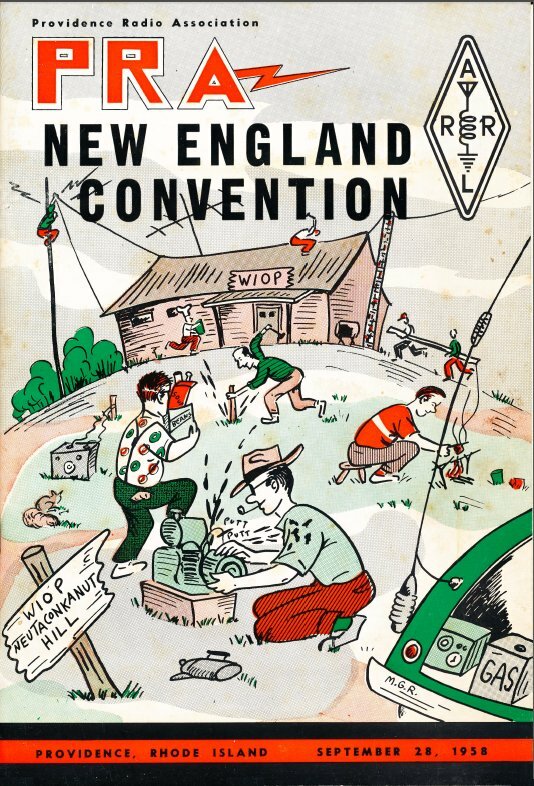 Little is known of this station other than the details contained in the various U.S. government call books at the time and the annual reports made by the club to the ARRL. 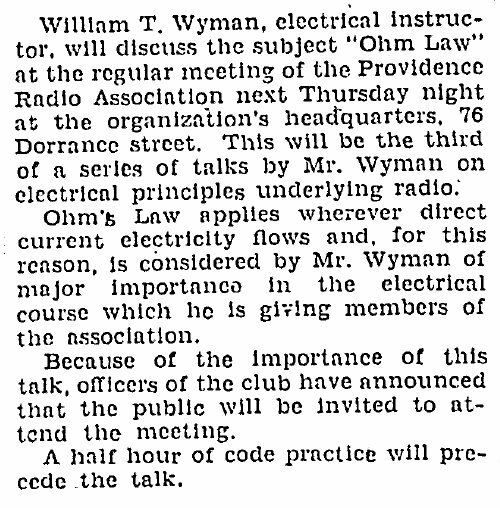 In 1925 the club showed a power of 50 watts, which sounds pretty run of the mill today. 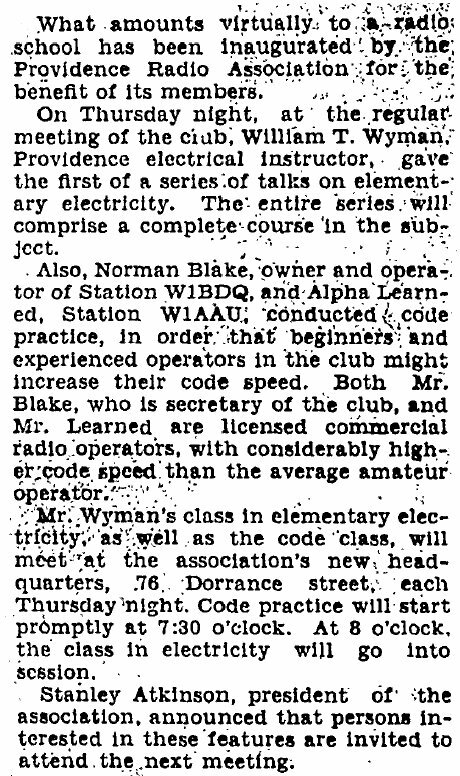 But it was a good sized station when we consider that in 1925 the highest power commercial broadcast station in Rhode Island was 500 watts and one station was a part timer running 20 watts 27. 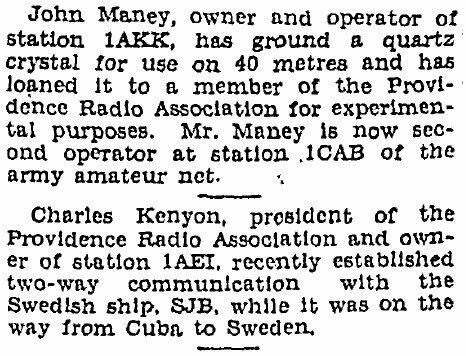 In 1928 when the international radio convention required the use of prefixes indicating the country of the station, the PRA was among the original group of ham stations that sported the new W prefix to their calls.